I just wanted to say that Michaela and I had the same thought last weekend and we both decided to give our closets a much needed spring cleaning. I took all the tips that Michalea has come up with here and applied it to my own closet and I can’t tell you how happy it’s made me. Not only did I manage to get rid of a lot of stuff that I never wear, I can now find things easily. It feels like I’ve gained a whole new wardrobe, I can see it all at a glance and it all stays wrinkle free since it’s not all shoved into the back corner of my closet! I must admit that there were a few things I wasn’t quite ready to get rid of completely so I packed up a box and stored it in my basement. I figure if I don’t use it for the next six months then I’ll be able to donate it. 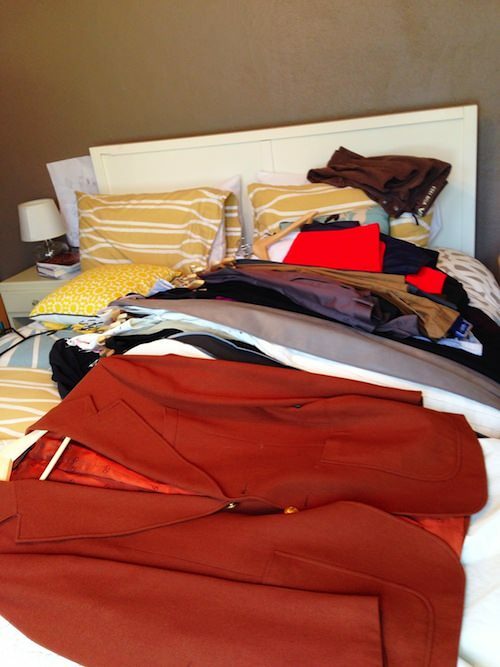 Thanks again Michaela for giving me the kick I need to get my closet (and my life) in order! Be sure to visit her at www.simple-sweep.com for more tips and tricks! Here is a before and after of my closet. I get giddy just looking at it! How many articles of clothing have you worn in the last 3 months? If you’re like me, probably just the same three shirts and jeans that are the easiest to find in my closet. I share a closet with my husband and after a few months it can get pretty crazy in there. So this week, we’re cleaning out our closets! 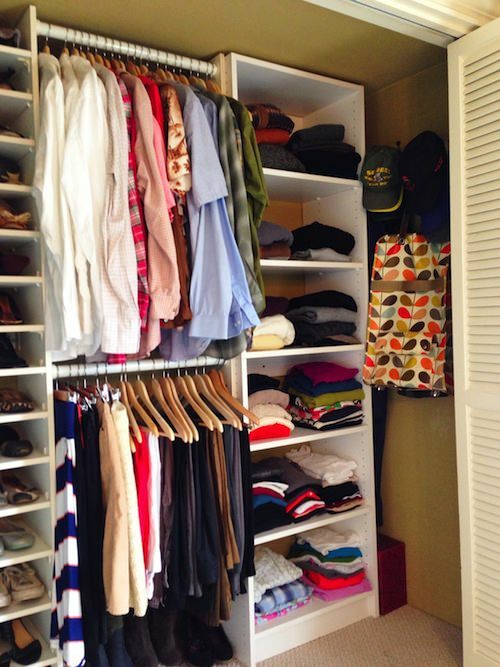 Here are 4 easy steps to get your closet looking like a million bucks without spending a dime. line up all your shoes and make a pile of all of your clothes. You’ll be shocked at how much you have. Step 2: weed through all of your clothes. 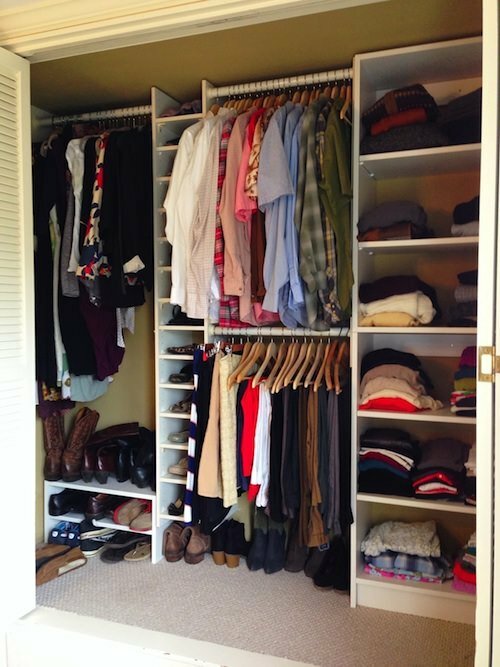 “Start with your closet and pull something out. Look at it and ask yourself, does this fit me? Does this flatter my figure and coloring? Does this function in my current lifestyle? And does this still feel good? I’m a little Mommy Dearest when it comes to hangers. NO WIRE HANGERS! You spent some good money on those clothes, and they deserve a good hanger. Using the same hanger or even the same color hanger is the easiest and cheapest way to make your closet look like a celebrity’s. I love these Huggable Hangers that run about $9.99 for a ten pack. Nothing slips off of them and they give your closet a clean uniform look. 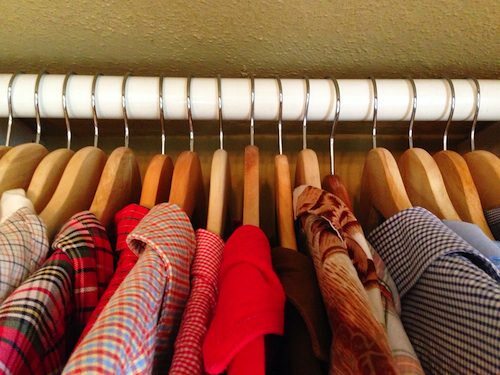 Hang all of your clothes the same direction with shirts all together, pants together, etc. You can put like colors together to help you easily find and coordinate outfits. After you do these 4 steps you’ll be surprised by all the new things you have to wear. Things you totally forgot about are now easy to find and you’ll feel so good every time you look at your gorgeous closet! 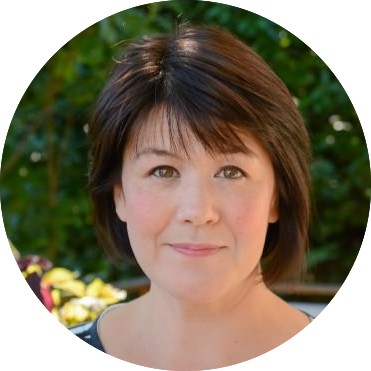 I love these simple tips, especially the 4 F’s. 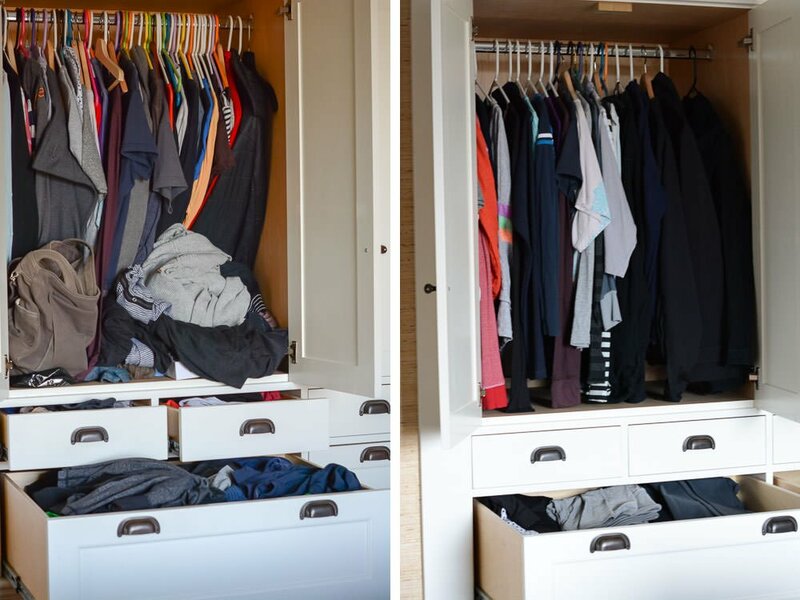 I have organized my clothes by color before and it really does make a huge difference. Thanks for the motivation to get my closet organized!